Samsung may be banking on the superior MicroLED tech for its future TVs, but the company’s QLED TV lineup is not going to disappear anytime soon. The company has been aggressively developing and marketing its new QLED TV offerings, including an 8K version. Samsung has already shown an 8K QLED TV at CES 2018 earlier this year and is now planning to show more of it at IFA 2018. 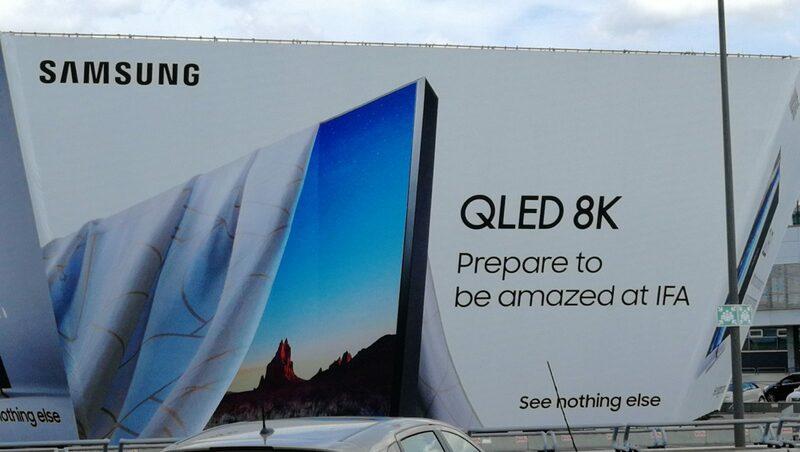 A Twitter user has posted a Samsung billboard from Berlin which says ‘QLED 8K’ and “Prepare to be amazed at IFA.” The straight-forward ad leaves nothing to the imagination and confirms Samsung’s plans to showcase its 8K QLED TV(s) at the upcoming event scheduled from August 31 to September 5 in Berlin, Germany. Unlike at CES, the company may also reveal the pricing and availability info for these TV(s). Considering that even 4K content is not easily accessible, one might argue 8K TVs are overkill, and it may very well be true. However, Samsung believes its AI-driven upscaling techniques will help you overcome the shortage or unavailability of 8K content. Whether those lofty promises are enough to convince users to pay a fortune for these future-proof TVs is debatable. Samsung is already working to bring a consumer version of the MicroLED TV to the market, but from what the company has revealed so far, MicroLED TVs may not become mainstream anytime soon. It is possible Samsung will continue to offer both QLED and MicroLED TVs at different price points, targeting different segments and use cases. I wonder will I see much difference to my 4k QLED TV I have now.